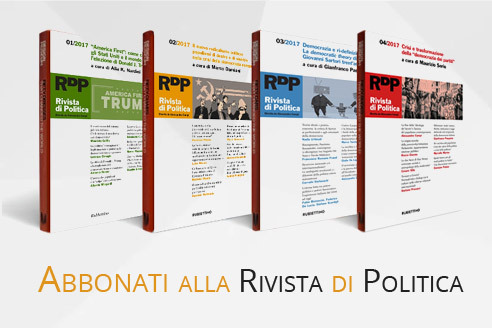 The publication of an article in our peerreviewed journal Rivista di Politica is an essential building block in the development of a coherent and respected network of knowledge. It is a direct reflection of the quality of the work of the authors and the institutions that support them. Peer-reviewed articles support and embody the scientific method. It is therefore important to agree upon standards of expected ethical behaviour for all parties involved in the act of publishing: the author, the journal editor, the peer reviewer, the publisher and the society. Rubbettino as publisher of the journal Rivista di Poltica takes its duties of guardianship over all stages of publishing extremely seriously and we recognize our ethical and other responsibilities. We are committed to ensuring that advertising, reprint or other commercial revenue has no impact or influence on editorial decisions. In addition, Rubbettino Editore and Editorial Board will assist in communications with other journals and/or publishers where this is useful and necessary. Authors of reports of original research should present an accurate account of the work performed as well as an objective discussion of its significance. Underlying data should berepresented accurately in the paper. A paper should contain sufficient detail and references to permit others to replicate the work. Fraudulent or knowingly inaccurate statements constitute unethical behavior and are unacceptable. The authors should ensure that they have written entirely original works, and if the authors have used the work and/or words of others, that this has been appropriately cited or quoted. Plagiarism in all its forms constitutes unethical publishing behavior and is unacceptable. Authorship should be limited to those who have made a significant contribution to th conception, design, execution, or interpretation of the reported study. All those who have made significant contributions should be listed as coauthors. The editor of a peer-reviewed journal Rivista diPolitica is responsible for deciding which of the articles submitted to the journal should be published. The validation of the work in question and its importance to researchers and readers must always drive such decisions. The editor may be guided by the policies of the journal’s editorial board and constrained by such legal requirements as shall then be in force regarding libel, copyright infringement and plagiarism. The editor may confer with other editors or reviewers in making this decision. Peer review assists the editor in making editorial decisions and through the editorial communications with the author may also assist the author in improving the paper. Peer review is an essential component of formal scholarly communication, and lies at the heart of the scientific method. Rubbettino Editore shares the view of many that all scholars who wish to contribute to publications have an obligation to do a fair share of reviewing.